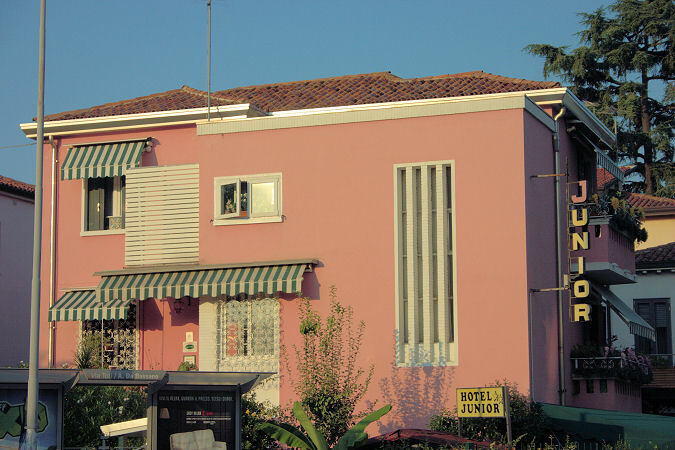 Smiling pinky house, our hotel, is located in a residential area. It offers you a peaceful environment in all the rooms, all equipped with air conditioning, bathroom, TV, and extra bed on request. We offer you our breakfast, in a charming room, or in the balcony, from 8 am to 9.30 am (but it can be anticipated on request). Just 5 minutes walk from the railway station, from where you can take the train to reach Venezia Treviso, Verona and neighbourhood. The No.13 bus, in front of the hotel, will take you to the historical centre in a few minutes, as well as to the conference centre “Papa Luciani”. You can easily reach us by car, from the motorway exit of Padova West, East, South, or with the shuttle buses from Catullo airport of Verona, Marco Polo airport of Venice, Canova airport of Treviso. We hope to leave you a good memory, as our guests testify, sending us postcards from all around the world.